Rossi rallies to second in gripping Argentina GP. 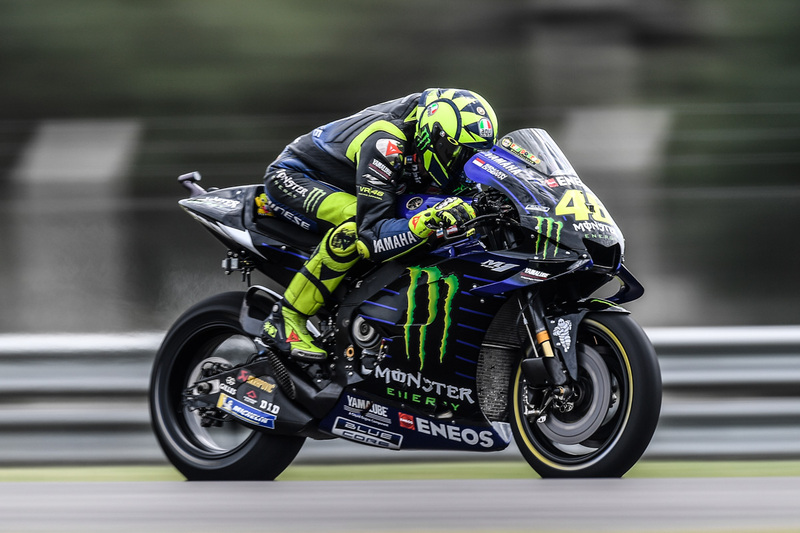 Monster Energy Yamaha MotoGP‘s Valentino Rossi had the crowds cheering as he returned to the podium at the Termas de Río Hondo circuit, exactly 23 years after his debut in the 125cc MotoGP class in 1996. Maverick Viñales was unlucky to fail to reach the finish line, due to a racing incident on the last lap. Massimo Meregalli Team Director: "We are very happy and satisfied with this second place, though we are disappointed for Maverick. This weekend the team worked really well. We had some difficulties in FP1 and we were able to correct them and find solutions quite early on. This morning after the Warm Up, Valentino ultimately made the right decision for him, choosing the medium rear tyre. It has been a good team effort, so we really want to enjoy this second place. Maverick was feeling well on the soft tyres during Warm Up, so he decided to go ahead with them. However, already from the beginning of the race he was having difficulties when stopping the bike. We have to analyse this problem and try to understand it, because it's a pity he couldn't be as fast as this morning. To make matter worse, he was collected by Morbidelli on the final lap. It was a shame, but the most important thing is that both riders are OK. Still, the podium result is a good boost for us all and gives us good motivation for the next round." Valentino Rossi: "It's been a long time – since Sachsenring last year – that I've been on the podium. This second place is especially satisfying, because at the last two races last year, Malaysia and Valencia, I was lying in first and second place, but I made some mistakes. Finishing the championship like that was very difficult to accept, so also for this reason this result is so important for me, my team, and Yamaha, after a difficult period. I'm so happy! I tried to stay in front, because I expected to be faster, but today with the increased temperatures I struggled a bit more. Dovi stayed in front of me and rode a very good race with a good pace. We were able to break away from the guys behind us and be on our own. In that moment I knew I had to be very precise on braking to take second place, without making any mistake of even 1cm, else Dovi would pass me again. At that moment I was riding good, I entered very fast. I'm happy because, first of all, overtaking on the last lap is always special, and also because I did very good on braking." Maverick Viñales: "I saw the replay of the incident with Franco and it was nothing. It was the last lap and we all tried to be at our best, so it's just one mistake, and it is what it is. Maybe at the next race I will make the same mistake, it's something you can explain, it's not a problem. The soft tyres were for sure the right decision, because in the first lap, though I didn't start well, I was overtaking many riders, so finally at the end of lap 1 I think I was third or fourth. So that was not bad. But the bike wasn't working perfectly, so we need to keep working and see if we can solve it for the next race. Honestly, I feel good at every track, we show good potential. It's always in the race that we have an issue. When the bike is there, I'm always in the top-3." Monster Energy Yamaha MotoGP‘s Maverick Viñales and Valentino Rossi were in the mix during today‘s Q2 session and secured second and fourth place on the grid respectively for tomorrow‘s Gran Premio Motul de la República Argentina. Massimo Meregalli Team Director: "We stuck to our plan for today and made another step. It was a very strong Q2 from both Maverick and Valentino. They are feeling comfortable on the bike, and a first and second row start bodes well for tomorrow. That said, there are still some uncertainties. The weather will play a deciding role in how the race is going to play out, and therefore we still need to make a final decision on the tyres, making tomorrow's Warm Up session very important. In any case, we feel positive about what happened today. Tomorrow we'll make some final set-up adjustments. We expect it will be a difficult race and tyre life will be a crucial factor." Maverick Viñales: "If you told me on Friday this was going to happen, I would have said 'No'. Yesterday, we were a bit lost, we struggled a lot, but we worked really hard. Every session we improved the bike. There's still room for improvement, so we keep working. We need our work to pay off. We need to start well, be at the front in the first laps, and I'm going to try to ride aggressively in the first laps. Let's see where that takes us. I'm going to try my best. I think it's going to be a difficult race, because everyone is very close. We don't know the race pace yet, but tomorrow we're going to try to reduce the gap to the front even further." Valentino Rossi: "It was a good Friday and a good Saturday. I'm happy to start from the fourth position because my lap was good, not so far from the pole position. I also had a good feeling with the bike and with the race tyres I have a good pace, it's not so bad. It's true that we have another five to six riders who are very strong. It will be a tough race, for sure. It will be important to try to work on the small details tonight and after we have to wait and see the conditions tomorrow, because the forecast is difficult. If it's a wet race, it's like we're starting from zero. Nobody knows. In the last races in the wet I was not so bad, but here I don't know. We hope that if it will be a wet race, we can also have a wet Warm Up."